I've been hard at work on the promised patches. You're already familiar with the first design, based on the Double Cup Tea logo by Evyn Fong. The new design is one of my own making. 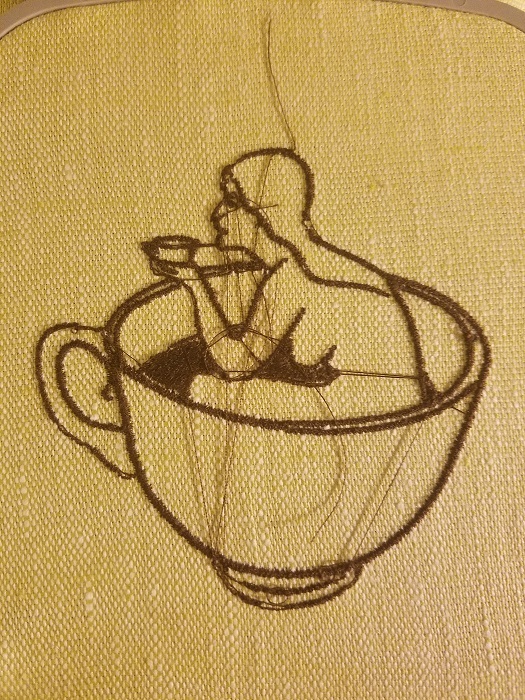 The imagery of a woman in a teacup goes way back for me. Imagine Anna, age 5, watching Thumbelina, pretending to be a tiny fairy. Now imagine Anna, a freshman in art college, crawling into a life-sized teacup of her own making (yes, this actually happened). The lady in the teacup is a quite moment to oneself. Double cup means many things to me - two cups in conversation - but also a cup within a cup, a symbol of continual reflection. The primary goal of this second design was to get used to using illustrator again, and test the capabilities of my digital embroidery machine. The previous design was all line work of one thickness. The new design has varied line work and a filled area (the tea, in grey and brown below). 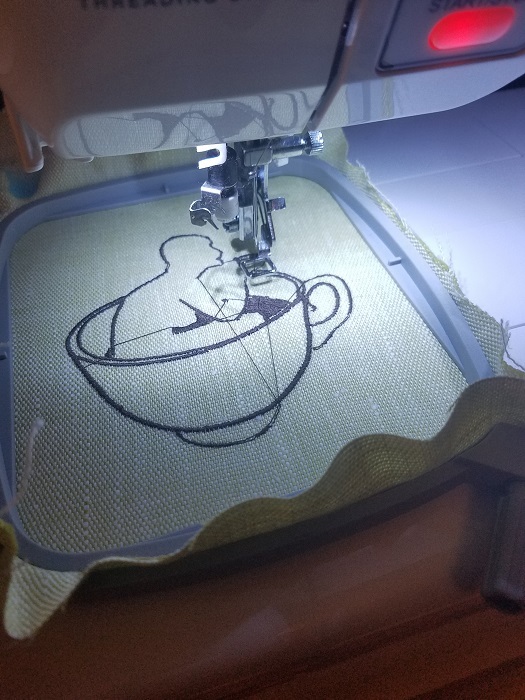 Some challenges taking the design into the singer futura embroidery software: smaller details that appear to show up in the display on screen disappear when stitched out. Notice the facial features in the orange patch, as well as the teacup she's holding, or the open spaces where the sides of the larger cup should meet the lip. Stylistically, the orange patch is my favorite - the gesture of the original design is still here, and the open spaces in the cup give it a delicate quality. In the second test I used a fabric of similar quality but of better contrast against the brown thread. I revised the design some, thickening and connecting lines that disappeared in the first test. I felt the changes to the smaller cup & hand were successful, but the lines in the larger cup and the hair were too stiff, and the profile of the nose needed more definition from the upper lip. I'm testing a variety of fabrics on the machine using rescued remnants from the interior design industry. These samples are all around 4 inches by 4 inches. I plan to try both designs at larger scales as well. My latest attempt at the design took an interesting turn. I tried layering a translucent fabric over a patterned one. The machine struggled on the larger fill areas - punching the bottom layer into the bobbin case, and pinning the hoop in place so that the design became misaligned. I think I can fix this in future by using a new needle, making sure the hoop is drawn as tight as possible, and reducing the amount of filled areas in the design. I fixed the nose definition problem in this latest iteration by changing the angle of the nostril and making it larger in the stitch program. When the design was "printed' I cut out the top fabric layer in the cups so that the pattern underneath was visible. 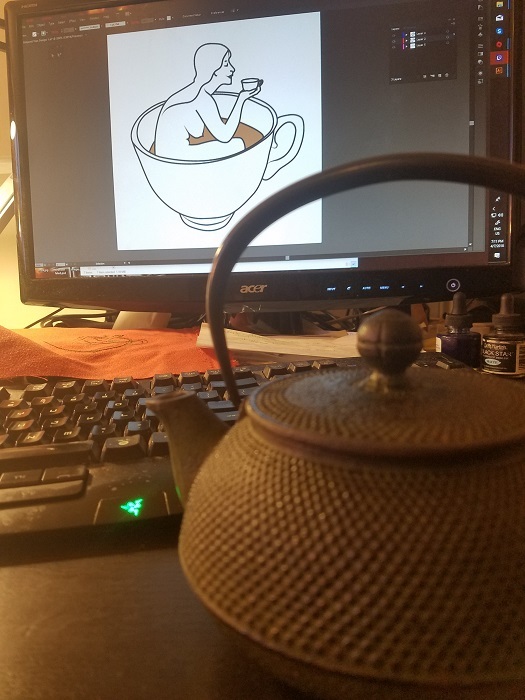 I colored in the hair, and the tea (since the fill thread got snagged) to add further definition. I especially like the effect that happens when you hold the design up to the light. The result is something like a tattooed lady. For display, I have an idea of framing these in a sort of lightbox using led's. I think this will be a great way to reuse some of the more interesting fabric scraps I've collected over the years. I'm excited to see where this goes!